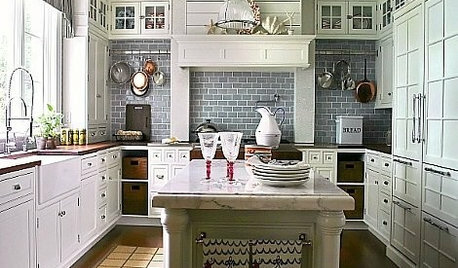 Which backsplash looks the best? Should I use the darker or the lighter, the longer or the shorter? Thanks! Can you post your whole kitchen as it will give us a better sense as to what tile size to suggest. On my monitor, the right side tiles look taupe? Are they or dark grey? Thanks. Since I don't trust monitor color... what color matches your flooring better? It appears to me the flooring is more taupey than grey? 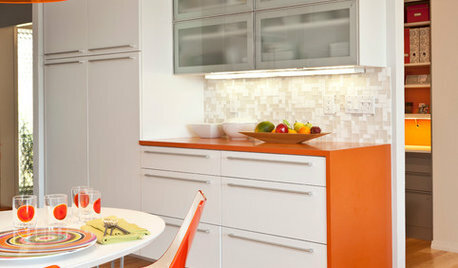 And both colors of the backsplash are in the countertop? 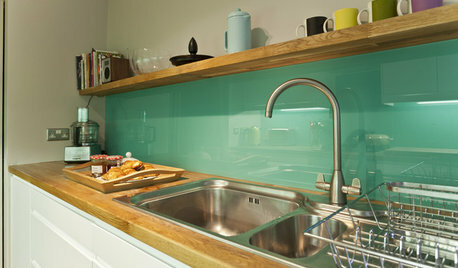 Is one color stronger than the other in the counter top? Sorry to ask so many ? 's but the photos are hard to decipher details. Is there one that you keep gravitating towards? Both colors are in the countertop. The floor is Sahara beige which has brown, tan, and an orange color to it. I am leaning towards the light gray but not sure which size to choose. Both of the tiles look good. The taupe does look a little dark to me. Thanks! Do not use the glossy one. I do not like the mosaic one at all. They never match up very well. Best to go with middle lighter subway in my opinion. 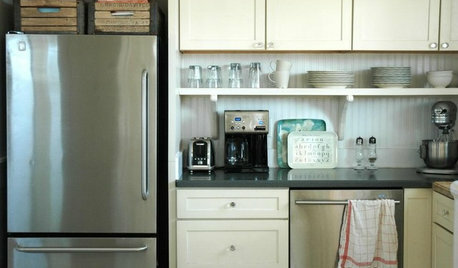 Be sure to add under cabinet LED lighting on dimmers. 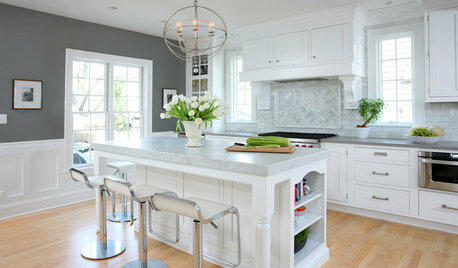 Pick up the darker color with some medium taupe or grey grout. Just do not go too dark with the grout. Ok- I always say go with your gut and since you are leaning towards the light grey, do away with the taupe & dark grey. Are there any differences other than the size of tile in the 2 grey? Such one is gloss the other matt? They are both the same except the size. One is reflecting more because it is tilting more from the wall. The only reason I even hint at the darker tile is because one person who sells tile in my area suggested I use black backsplash. Oh my - please don't use black in your lovely kitchen! 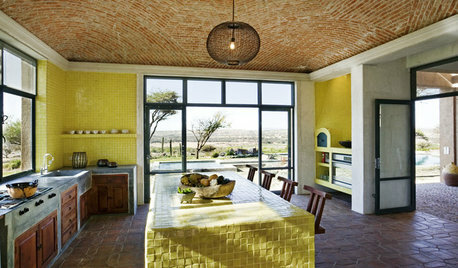 I agree with sandraclark - I like the middle subway tile. Keep it light! I love the full-height splash look if it's in your budget. This one here is solid surface, but you get the idea. I'm glad to see you stayed away from the black. Grey it is as the taupe wasn't a possibility to begin with. 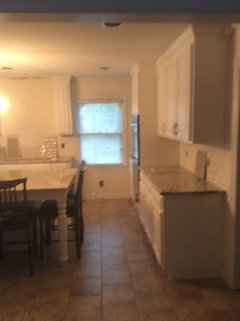 What is going in between the 2 cabinets, right of sink? I'd keep trying other subway shaped tiles, different colors and textures. I'd stick with the traditional vibe you have with your other materials. Once you finalize the color, light rather than dark, stick with a standard size subway. 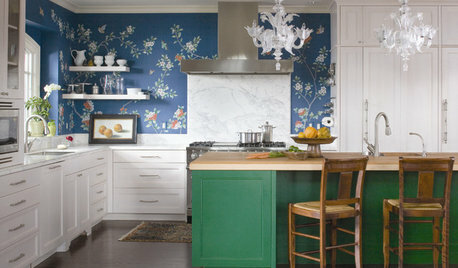 Resist the urge to get too unique with the backsplash. I appreciate all the good advice. I plan to put a stainless chimney style hood between the two cabinets. 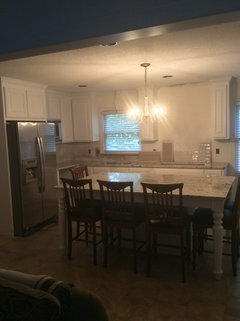 I'm also wondering if it's a nice look to run the backsplash all the way up to the crown behind the hood and above the windows or just below the hood and under the cabinets. Thanks again! Is there any chance that you will be putting up a valance on that window? What one of the tile placement do you like? I don't plan to put a balance. 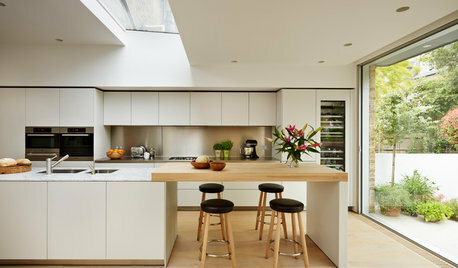 The cabinet to the right of the right window is open facing towards the kitchen. I like the pic with the tile going all the way up. I'm sort of think that wall will look batter if I put it above the window because of a pic I've seen on this site. 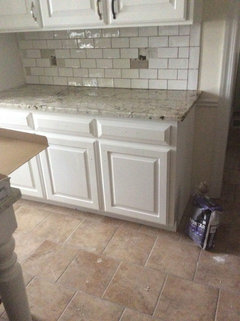 After trying to look for that photo, I've noticed I like a lot of them that have the tile going up behind the hood and the rest only bottom cabinet height. 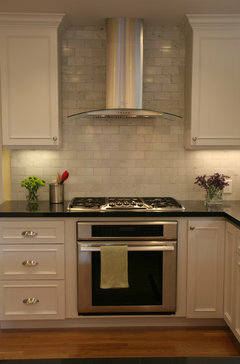 Though it makes no sense to have a backsplash all the way up the wall, these look so good to me(see pics). Thanks to you all, especially tedbixby. You are welcome. And of course it makes sense to take the tile all the way up as it makes it look finished and most importantly you like it :) And at the end of the day, that is all that matters. 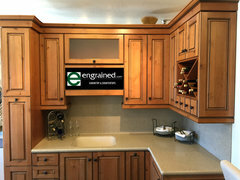 Enjoy your beautiful new kitchen. I'm trying to understand the design idea. Should the backsplash match the floor? 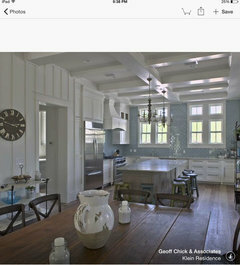 In most of the pics on houzz it doesn't look like that is done. 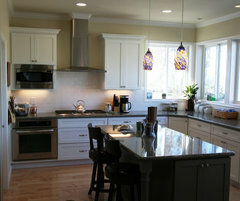 A lot have a dark brown floor with some other color counter and then another for the backsplash. One of the backsplashes I am deciding between matches the floor better(dark) but the main color in the granite matches another(light) better. The dark color is in the granite but is not as dominate. Any help is greatly appreciated. I wouldn't do any of them. I would keep it simple and do an extended (oversized) lip from the countertop - over 4" . Ew, no. 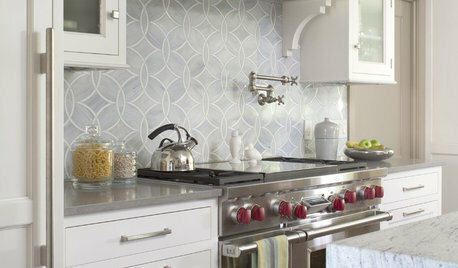 Do an actual backsplash. Pick what looks best to you. 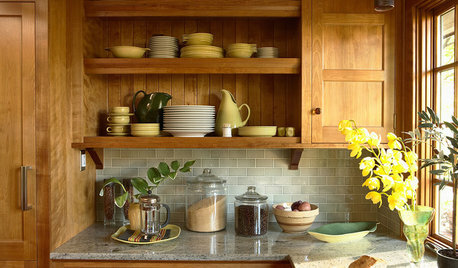 you can never, ever go wrong with subway tiles. they look modern and classic all at once, and will never go out of style. that said, the herringbone is elegant and would add such a nice texture to the overall space. now, if you were to choose the herringbone, be very conscious to not have a lot of items out on the counterops, because the pattern of the tile can look too busy if there is alot in front of it. in other words....no clutter. ;) either way you can't go wrong. have some fun with it!! Here is a link to what I suggested. I see it as elegant and timeless. Does this look ok? I'm getting mixed vibes. Any suggestions? 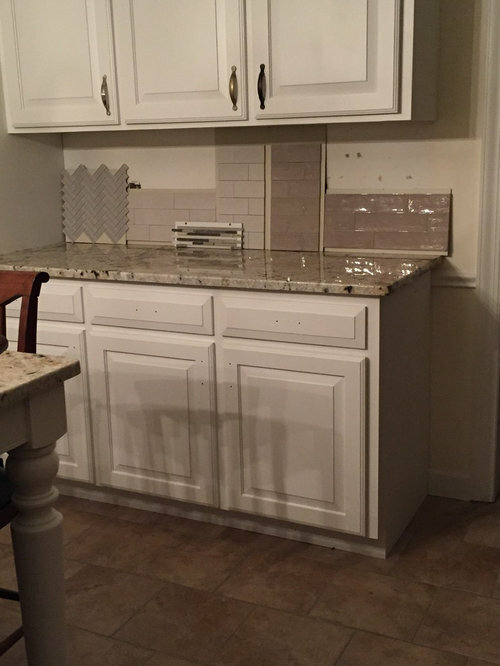 What grout would look best? Thanks!